If you are lucky enough to live in a house that has a garden, no matter how small or how big your outdoor space is you are well acquainted with the problems that may arise with keeping it into top condition at all times. The easiest way to maintain it tidy, clutter-free and looking exactly the way you want it to is to hire us for our premium quality London rubbish removal services. In general, what is going to happen once you call us is that we are going to send a team of certified rubbish removal technicians and a waste collection truck fitted to the size of the job you are hiring us for to your place. We will arrive right on time – not a minute later or earlier than we have arranged in advance. We will use proper tools and tested methods to collect and load all garden waste that you want to get rid of, and then drive it to a nearby depot for recycling. If it sounds simple that’s because it truly is. 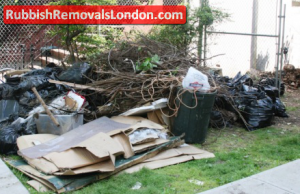 We have been doing garden clearance in London for many years now and we have never failed to achieve only highest levels of satisfaction with all our clients. In addition to simply hauling the junk on the truck and driving away, our friendly and energetic London garden clearance technicians will be able to provide you with some useful tips about maintaining and designing your outdoor space, building compost at home and much more. We are not plain workers, we are professionals who love their job and never seize to learn new things and share their knowledge. Turn your backyard into a junk-free zone today. Give our around the clock customer support a call or write us an email, depending on which means of communication is more suited to your preferences, and book your garden clearance in London for the day and time that you want it to be carried out. Do not forget to ask for a free no obligation estimate for the full price of the task, so that you can make sure we are able to provide you with the best price on the market. London is known as the greenest capital in Europe. With nearly a quarter of its territory covered by public parks, commons, gardens and forests, London is home to popular destinations as Hyde Park, Kensington Gardens, Kew Gardens, Wimbledon Common and St James’s Park among others. Additional attractions in London include the London Zoo, Buckingham Palace, The Eye etc. which attract over 30 million tourists from all over the world. Heathrow International Airport is a major travel hub to and from London.